Campaign #2 has begun, and it’s a conversation starter. This time around, we’ve teamed up with the fantastic folks at St. Paul Street Evangelization. 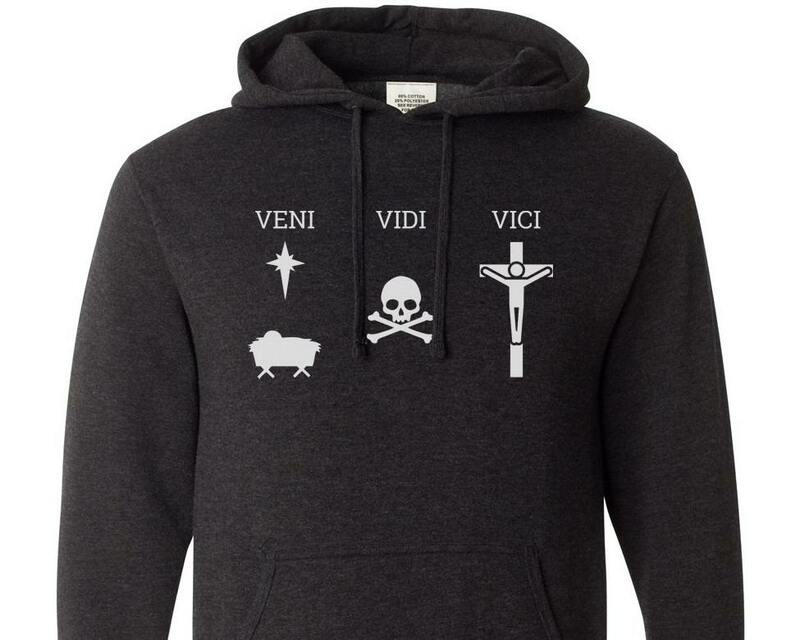 They will receive atleast 25% of the proceeds from the sale of our new Veni – Vidi – Vici T-shirt & Hoodie. Don’t know what “Veni Vidi Vici” means? Don’t worry; many people don’t. So, count on being asked about it and using that as an opportunity to share your faith. But so that you do know, it means “I came. I saw. I conquered.” Jesus came in the flesh. He saw the sin and death in the world. And he definitively conquered sin and death on Calvary. BOOM goes the Gospel!